Part one of our 2016 K-League Classic Preview looks at Gwangju FC, Incheon United, Jeju United, Jeonbuk Motors, Jeonnam Dragons, and Pohang Steelers. We look at the key arrivals, departures, strengths, and weaknesses of each of these sides, before assessing their chances for the upcoming season. Gwangju finished one place above the relegation zone last season, and could’ve been in serious trouble if not for the abject form of Busan and Daejeon. Towards the end of the season, Gwangju went on a horrific run of seven defeats in ten games. Their squad has had a lot less chopping and changing than some of the other squads in the division. There is a level of togetherness in the team, and many players are slightly underrated. They have also lost their main striker this winter, with Kim Ho-nam leaving for Jeju United. Gwangju’s winter signings are certainly not going to set the world alight. Kim Jeong-Hyun, who joins from Japanese side Oita Trinita, is probably the best of the bunch. Jong Jo-gook, who once played for Nancy and Auxerre in France, also joins the club as Kim Ho-nam’s replacement. Gwangju have done little to arrest their slide in form over the winter, and are likely to spend most of this season in a relegation battle. Incheon United started last season poorly, even falling into the bottom two for a period, before a strong mid-season run took them up to sixth. They just missed out on a top half finish, and in the end fell away to eighth. The highlight of Incheon’s season was a run to the FA Cup final. They required extra time to get past Jeju United in the quarter finals and Jeonnam Dragons in the semi-final, and nearly took FC Seoul to extra-time in the final too. Eventually succumbing to an eighty-eighth minute goal by Adriano. Incheon lost their keeper, Yoo Hyun, to FC Seoul over the winter, but managed to keep hold of key defender Matej Jonjić. Jonjić is joined in defense by Cho Byung-kuk who joins from Thai side Chonburi. Incheon have also made one of the more interesting signings of the winter, bringing in young Vietnamese ‘next-big-thing’ Luong Xuân Truòng. Incheon’s lack of firepower may cost them this season. They only scored 35 goals last season, and since then, Kim In-sung has moved to Ulsan, leaving much of the goalscoring burden to Kevin Oris. Macedonia international Krste Velkoski’s arrival will help on the goal-scoring side of things if he can settle in well. Yoo Hyun’s departure also weakens Incheon between the sticks this year, which could affect a defence that was pretty solid last season. Lower mid-table, could potentially get sucked into the relegation mix due to the lack of goals in the team. 6th. Games involving Jeju were often quite spectacular events. Their free-attacking style got them lots of goals, but they were often very open at the back. Jeju was also involved in some media-grabbing off-field issues with forward Kang Soo-il (mustache cream-gate and drink driving). The team got off to a good start, but faltered down the stretch. Jeju’s biggest strength is probably their commitment to playing an attacking game, one of the few K League sides to do so. Kim Hyun and Kim Ho-nam should give them some quality up top despite the loss of Lopes. Lee Chang-min and Song Jin-hyung should provide a spark in midfield. Those four should give smaller teams fits, and give them a chance against the bigger sides. Jeju has done relatively well (comparatively speaking) in scouting and finding good South American imports, and Marcelo Toscano could be an interesting addition as well. Defense will again be under the spotlight for Jeju, and they’ll need to improve from last season if they’re to challenge for Asia. The side lost Australian centerback Jovanovic to China, as well as Jung Da-hwon to military service. Jeju brought in two players from overseas (Lee Gwang-sun and Chung Woong), and they’ll likely need to get settled quickly. Midtable (6-8). Jeju has the quality to comfortably stay out of the relegation fight, but a significant loss of key players and starting XI turnover means the ride may be a bit bumpier than last season. Champions. Jeonbuk cruised through 2015 and were atop the table for almost the whole season. Solid, but rarely spectacular, Edu and then Lee Dong-gook provided the goals with Lee Jae-sung pulling the strings. The boys in green did win the league, but failed to win (or progress that deep) in the AFC Champions League, and was also knocked out of the KFA Cup. Jeonbuk is loaded up top, and figuring out how to fit so many players into his starting XI will be the biggest challenge facing coach Choi Kang-hee. Squad rotation will be the name of the game, and if Jeonbuk can get their new faces working together as a cohesive unit, watch out! Kim Shin-wook reportedly would’ve headed to Celtic but for work permit issues. Kim won’t blow you away with pace or technical ability, but his ability to score in the K League is undoubted, and he should boost the Jeonbuk attack. Lee Dong-gook remains a solid striker despite his advancing age. Lee Jong-ho and Lopes give them more dynamic options from the flanks, and Kim Bo-kyung and Lee Jae-sung should provide plenty of quality in the middle. Like many big spending sides, Jeonbuk has spent heavily on attack with little thought to the defensive side of things. The last-minute loss of Kim Kee-hee is a blow as it leaves Jeonbuk’s defense a bit lacking. A strong counterattacking side should be able to cause them problems. Kim Hyung-il and Lim Jong-eun are the only two senior centerbacks which isn’t confidence inspiring. Lee Ho is the only experienced holding midfielder. Another issue for Jeonbuk will be the amped up U23 rule (which states that teams must have two U23 players in their match day squad and that one must start. Lee Jaesung will no longer fill that requirement, and Jeonbuk will need to find other options. Champions. Seoul should give them a run for their money, but Jeonbuk’s strength in depth should be enough to see them through to a third-straight title. An absolute rollercoaster of a season, Jeonnam had. Jeonnam is one of the textbook midtable teams in the K League, but last season they managed to claw their way up to third place, held the AFC CL positions for a while (won 9/13), then promptly dropped back to the midtable range where they belong (after a 12 game winless streak in the fall). Jeonnam boasted quite the attacking trio in Ristic – Orsic – Lee Jong Ho. Combined, they scored a total of 35 goals! Unfortunately, Lee Jong Ho has moved on and signed for Jeonbuk, but I am confident Cho Suk Jae (19 goals in the challenge) will be a decent replacement. 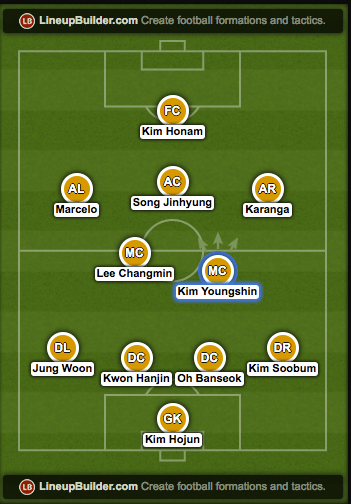 In the midfield Jeonnam is fairly talented as well with players like Kim Young Wook, Ahn Yong Woo, and Lee Chang Min. Also, a very talented central midfielder by the name of Han Chan Hee has signed from their youth academy – he’s featured with the U18 team, is the same age as Paik Seung Ho, and is a direct position rival. Overall, Ristic Orsic and Cho Suk Jae have the potential to make Jeonnam quite the scary team capable of producing goals. In defense Jeonnam has been a little lackluster, featuring one of the leakiest defenses of the K League (51 conceded), though some of that is attributable to some goalkeeping errors on Kim Byung Ji’s part. Will last season’s backup GK’s be able to improve? Anyways, the weakness for Jeonnam has always been keeping goals out, and considering that they haven’t really bolstered their defensive options much, we may see the same old leaky Jeonnam unless their GK or CBs can really step up. Midtable. As usual. In the small likelihood that the attacking trio can sustain that summer form that propelled them to 3rd place, Jeonnam will oviously do much better, but they’ll almost certainly still be midtable this season (6-9). I suspect Pohang fans will have mixed feelings about 2015. Despite a poor start for Pohang standards, Pohang managed to get their act together and climb back up to the 3rd/4th place spot they’ve been at for the vast majority of the season, but they certainly could have done better in both the FA Cup and the league. One big question for Pohang in 2015 was how to replace the departed Lee Myung Joo – I still don’t think he’s been replaced in full, but Son Jun Ho and Shin Jin Ho really stepped up in that MF region. Kim Seung Dae had a slightly quiet season for his standards (if the standard is his glorious partnership with LMJ back in the days), while youngsters Moon Chang Jin and Lee Gwang Hyeok really showed their promise. Moreover, Hwang Sun Hong retired, leaving a very inexperienced Choi Jin Cheol in the hotseat. Pohang have struggled to recreate that amazing Steel-taka play that propelled them to victory in 2013 and a long stay as 1st place in the first half of 2014 (which all went to hell when Lee Myung Joo left), but they have still been solid and really deserved their 3rd place finish. In the Pohang squad a very creative midfield led by Son Jun Ho that drives a passing-oriented team stands out, but to me Pohang is fairly balanced all around. “Solid” is a very appropriate word here. They had decent attacking players in Kim SD and Go Mu Yeol, strong on the flanks with Moon CJ and Lee GH, very strong in central midfield (a constant strength for Pohang), and a decent defense that didn’t concede too often…. … but are at times capable of melting down completely (see Jeju 4-3 Pohang where the DF got wrecked) and had to rely on Shin Hwa Yong to save the blushes. Pohang have struggled at times with finishing. Exacerbating this problem is that three of their key attacking players in KSD, KMY, and SJH (OK he’s a deep MF but he was a good goal threat) all left, and Pohang hasn’t done a very good job of replacing them aside from Yang Dong Hyun (a great buy I must say). The attack must improve if Pohang are to do well. Yang DH and Son JH can’t hard carry so a larger burden will be put on the squad players from last season and the injury prone but very talented youngsters to really provide some goals. 3rd place – after losing so many players, this season’s Pohang doesn’t seem as menacing as Pohang sides of the past, and the inexperience of Choi JC may make for a rough season for Pohang. A lot of players have left and their youth players – from the famed Pocheol HS academy – will REALLY have to step up if they are to produce goals. However, I personally believe the stability of the backline and midfield, the quality of players like Son Joon Ho, and the continuous influx of random very talented Pocheol graduates (like Jung Won Jin, who played very well in the CL vs Urawa) will propel Pohang to a 3rd place place finish – 3rd if lucky, 4th if unlucky. Meanwhile, here’s a little more realistic lineup… assuming that Jung Won Jin has made enough of an impact vs. Urawa to play regularly, though TBH Lazar is more likely to start there. This league table was made by taking the average of each of the Tavern Writer’s predictions. To read the previews for the other teams in the K-league, please read 2016 K-League Classic Preview: Part Two.